Nature’s Way – North Devon’s gateway to natural health. 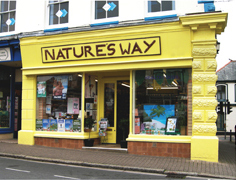 Already well-established in the popular North Devon market town of Holsworthy, Nature’s Way health store changed ownership in 2008 and the new owners have worked hard to expand the range of products for the health and wellbeing of customers. Favouring high quality and affordable brands from the UK’s leading manufacturers and local producers, we stock an extensive range of vitamins, minerals, herbal supplements, natural bodycare & toiletries, cruelty-free cosmetics, eco-friendly household products, sports nutrition, as well as specialist and local foods. This entry was posted in shopping and tagged Devon, health food, Holsworthy, local produce. Bookmark the permalink.